Spending a glorious week in May at Torre Del Tartufo in the Tuscan hills was one of the most wonderful vacations I have ever had. The experience far exceeded my expectations. From the moment we arrived, we were treated as long time friends and the accommodations were spectacular - views all around. The week long cooking class was a treat I will never forget. Our wonderful chef Franco and his assistant Paula made time in the kitchen so much fun, as well as a terrific learning experience. I truly want to go back some time soon. The relaxing atmosphere created the perfect ambiance for the combination of exploration on our side trips, hiking around the grounds and relaxation with new friends. Room tip: I saw most of the rooms at Torre del Tartufo and they were all just fine. Some were smaller than others, but what I saw was great. I had one of the BEST I believe. I was in the room called Basilico (perfect since I adore basil!) As one friend said, there was a view even from the toilet. We decided to spend a week in Tuscany and enhance our vacation with Italian cooking classes for our 30th wedding anniversary. After a long and careful search of all offerings on the internet I decided on Tuscookany and their Torre del Tortufo location (they have 2 other locations). We flew to Rome, rented a small fiat and headed north to Tuscany in August. Although August is very hot in Italy and I wouldn't recommend it as a vacation month to visit the larger cities like Rome, especially because most restaurants, clubs and stores are closed due to August being the vacation month for Italians, going to a mountaintop vacation in the northern part of the country during August proved to be perfect both weather and traffic wise. One fact that is not mentioned in the Tuscookany site (not surprisingly) is the horrific dirt road that leads to Torre del Tortufo. Our little fiat stalled at one point trying to navigate a steep curve and I had to burn some tire and cause gravel to fly all around us to get going again. I couldn't be happier that we were in a rental and not our own car. My wife and I switched from initial shock to "we're going to enjoy this no matter what" laughter and kept going. Once we drove over the top of the mountain and saw the compound, we knew it was worth the agony of the climb. We descended into heaven on earth. We met a very nice group of people (we were 12 altogether) for our cooking week. Our chef Franco and his helping staff in the kitchen as well as the property managers Lena and Alex were very friendly and helpful. The property is large enough to provide for privacy in the building and outside. We never felt crowded even around the beautiful pool. The pool is spectacular. Filled with natural mountain water and heated through a pipe system that draws heat from the sun through an area outfitted with black stone tiles. This does not turn the water into a bath tub by no means but makes it comfortable cool. The entire resort conforms to eco-tourism principals. They do not use chlorine or other chemicals. You can use their wash machine to do your own laundry but have to use their eco-friendly detergent. Cooking classes are daily from 3pm to 7pm except on Wednesday and you eat what you cook. Everyone is divided into teams and prepares a section of the dinner on a rotating basis. A cook book prepared by Franco is your guide and of course Franco is there to supervise and help answer any questions, give tips and correct mistakes. On Wednesday they take you on a tour of Tuscany. We visited a winery, an olive oil factory and a cheese factory. Saturday is a free day for everyone. I recommend to make daily excursions to surrounding areas (yes you have to brave the terrible dirt road down and up the mountain). On our day off we went to Florence which most of the other participants did as well but you can just stay at the resort and enjoy the pool. Anghiari is the closest major town to the resort and a must see as well. Massages can be scheduled ahead of time. A therapist comes to the resort and provides massages till 1pm. Overall it was a great vacation if you are into cooking and nature. Driving around in the narrow winding roads of Tuscany through picture perfect farms and villages was delightful. I would recommend this place to couples, families and singles (we had two in our group). Words and photos cannot adequately convey the beauty and bliss you will experience at Torre del Tartufo! I attended the 3 day class in mid-July, and this experience wildly surpassed any of my expectations. The quality & quantity of the cooking classes were incredible and Franco and Paola were incredibly skilled and patient teachers! They do all of the prep and clean-up work which leaves you ample time to be fully engaged in the cooking experience. Franco is an incredibly talented Chef who really exposed us to a wide variety of traditional Tuscan dishes. 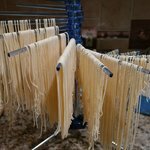 This is NOT a spaghetti and meatball type of cooking class......You will leave feeling very confident in your ability to produce delicious 4 course Tuscan meals. The spacious and beautiful kitchen is fully equipped with every possible cooking implement & gadget, including many cooking tools I had never seen or used before. The cooking classes are great, because you are assigned to a team and get to cook all elements of a 4 course meal at every cooking lesson. Franco purposely splits people traveling together which quickly builds friendships and team work. The teams are all preparing different meals each day, so it quickly exposes you to a wide variety of Tuscan delicacies. You will learn everything from basic pasta and pizza dough, to very rich and complex main dishes and desserts. Be prepared to cook for several hours, followed by eating & drinking for several hours in the evening. Each evening, there was a wide variety of wines and liquors available for guests to enjoy before and after the meal. Italian red, white and rose wines are always available to guests 24/7. In addition to a traditional oven, there is an outdoor wood fired oven that really enhances the pizzas and some of the main dishes you will prepare. The full-day field trip was really incredible! We started out at a private family owned and operated vineyard/winery, traveled to an olive oil farm, visited a linen factory and hilltop village and ended up at a goat farm where an incredible variety of goat cheeses are produced. I even had the opportunity to milk a goat!! The Tuscan landscape on the journey is truly amazing, and you will pass many fields of tobacco and sun flowers. The Villa is very large and the rooms, accommodations and grounds are absolutely gorgeous! The gardening on the property is absolutely breathtaking and you will walk out of the kitchen to clip your own herbs for the dishes you prepare. Clipping my own basil, rosemary and thyme to add to my dishes was a pretty surreal experience! Lavender, roses and many other flowers were in full bloom during my class in July. There were thousands of bees on the flowers, but they never bothered any of the guests. If you are allergic to bee stings, make sure you have an Epi-Pen available, just to be safe. There is a really lovely pool, with a wood-fired hot tub that looks out over the expanse of the Tuscan hills. A sauna and steam bath are also available for your enjoyment. I booked the massage therapist, and she was fabulous. The hour long massage was only 60 Euros and well worth the price. I was alone for the class and never felt alone for a moment. The participants were from the US, UK, Netherlands and Australia during my class. All of the participants and Villa staff members were incredibly warm and friendly. We had 2 women traveling alone, 2 sets of mothers and daughters and 3 couples who attended my class. The gentlemen did not attend the class but enjoyed the beauty & serenity of the Villa and surrounding area while their partners participated in the cooking classes. They rejoined us for the meals and thoroughly enjoyed our cooking! Each day we dined on a really lovely outdoor table which Paola draped in different linens and themes for each meal. There were beautiful arrangements of fresh flowers on the table at each meal! All of the ingredients in the cook book you will utilize and take home are based on the metric system, so if you are from the US, brush up on your metrics before you attend. The cookbook you will take home is really an incredible resource. As I mentioned, Franco and Paola are absolutely incredible, as are Lena and Alex who oversee the entire property and serve as your hosts. The breakfast and lunch options were ample and truly delicious! I loved the class so much that I plan to go back with my mother and sisters this Fall. As others have mentioned, the gravel road up to the Villa is incredibly treacherous. I had a rental car and was terrified that my tires would blow on the way up to the Villa. Once you arrive at the Villa, trust me, you will never want to leave........You will leave with an incredible bottle of Franco's Balsamic Vinegar and his incredible Truffle Paste. The flavors will blow your mind! I cannot recommend this experience highly enough. I have traveled all over the world, and this was truly a magical experience! Room tip: Some of the rooms do have wood-burning fire places and there are 2 bedroom, 2 bathroom apartments available for families and larger groups. The passageway bedroom has a canopied 4-poster bed and has a very romantic ambiance great for couples traveling together. We (husband and wife and daughters 15 and 17 years old) spent 6 days in paradise at Torre del Tarfufo. The setting is amazing, set on a hill overlooking the rolling hills of Tuscany. To open your window in the morning with this view is a great start of the day. Each detail at Torre del Tartufo is looked after, the interior, the pleasant staff, endless wonderful food and wine, beautiful in and outdoors, yet in a very relaxed matter fitting the scenic landscape perfectly. Even if you are not cooking there is plenty to do. We did sightseeing in the area, Arezzo, Florence, Siena and relaxing by the beautiful pool, or in one of the hammocks. We met wonderful guests from Australia, Canada, London and the USA and they all seem to become friends for life after a couple of days. You feel at home and don't want to leave.....Thanks for the wonderful vacation! This holiday exceeded all expectations. The villa was amazing the food and wine was the best you would get anywhere.Franco and Paolo made our time in the kitchen extremely fun and you take home a lot of tips and new ideas. Alex and Lena were amazing hosts they make you feel like part of the family from the moment you arrive. We had a wonderful group with us and everyday was spent laughing eating and drinking who could ask for a better holiday. I don't think anyone wanted to leave at the end of the week. Will definitely return soon hopefully. Room tip: There is no such thing as a bad room at this hotel. They all are wonderful.